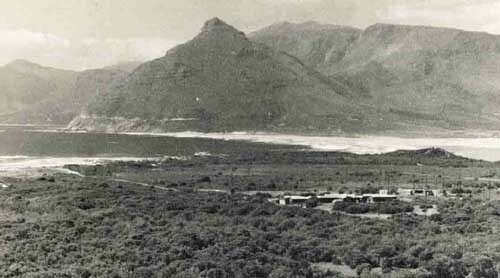 A picture of Kommetjie about 50 years ago with Wireless Road, the radio station on the right of the naval barracks in the centre of the picture. Cape Town Radio is a maritime station with its main task being that of communication with ships at sea. The station began its days in Kommetjie way back in 1910 when it was housed in a building near to the Slangkop lighthouse. The building is built of rock with a tiled roof and is still there today. In those days life was difficult for the staff as they had to contend with sulphorous fumes from the radio equipmment they used. So much so that the windows of the building were kept open day and night 365 days of the year to allow the fumes to escape. It was Cape Town Radio's job to monitor shipping around the Cape Coast and to work any distress calls that might occur. The call sign for the radio was VNC. In 1928 however the call sign was changed to ZSC and remains the same to this day. During the second world war the station was moved from its position on the coast next to the lighthouse in Kommetjie to Wireless Road north east of its position in Lighthouse road. The reason for the move was the poor reception they had at the site under the Slangkop mountain. The mountain contains manganese deposits which disturbed reception at the station. The new building was much larger and was shared with the Royal Navy. It maintained close links with the navy in Simonstown. The new station building was situated in the middle of a deserted area surrounded by bush about three kilometres from Kommetjie. The area was rich in wildlife, meerkats, snakes such as the Cape Cobra, Puff Adder and very large mole snakes. Some of them measured up to two metres in length. As a child one learned quickly how to avoid the snakes and one always kept a look out for puff adders which loved to lie in the sun in the pathways through the bush. Being very lazy snakes they don't move when they hear you coming.Should you step on one its bite can be fatal. Living in the station grounds I often visited the radio station and rode my bike around the building which was surrounded by a concrete wall of about 2 metres in height. It never occurred to me then but the wall was probably to protect the building from being bombed from the air during the war years. Mr Arthur Fairman taking down a morse coded telegram from a ship at sea. 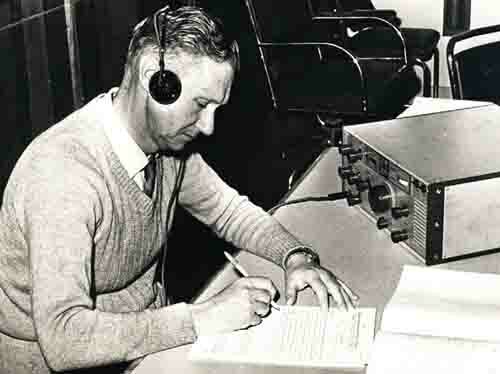 My father the late Arthur Fairman was one of the operators in the station and often worked the distress calls that were monitored by Cape Town radio. It was quite sad during the war years when CT Radio monitored the airwaves and heard ships calling for help after being attacked by enemy submarines. As CT Radio had to maintain radio silence all they could do was advise the authorities of the attacks. Many funny incidents happened at the station over the years. The station had a car which was used to transport staff members to and from Kommetjie to go on duty. One day one of the men who had his lunch in a small suitcase was driving to office when the case fell off the seat next to him and landed under the car's brake pedal. As he could not stop the car he drove it into the parking garage and ended up hitting the rear wall to stop the car. Suffice to say his lunch was flattened. Another operator had a very fussy cat which ate steak and not much else. Its owner Charlie Kennett had to leave it behind in the navy barracks when he went on leave and asked the sailors there to care for it. He supplied its meat and food. The sailors however decided that they would teach the cat a lesson and fed it scraps while they ate its steak. On his return Charlie was most upset at the treatment meted out to his cat by the sailors. Cape Town Radio came into its own during the Suez canal crisis in June 1965. All shipping that normally went through the canal was diverted around Cape Town and caused congestion not only at all South African ports but also congestion of the radio waves. For years there were hundreds of ships lying in Table Bay waiting to get into the harbour for supplies. To enable themselves to be able to handle the radio traffic CT Radio introduced time schedules where they placed ships in queues. There could be as many as 27 ships in the queue at a time. The Suez Canal was closed for eight years and during that time Cape Town Radio built up and an excellent reputation for itself. In 1965 the powers that be decided to move the radio station from its position in Wireless Road in Kommetjie to Milnerton. The new station took up residence in a large old building which looked much like the dance halls of old. It had a large central floor where most of the consoles for those monitoring morse code were housed and around the edge smaller rooms for radio telephones, telex and telegrams. It was interesting to watch the operators sending out morse code. They got so good at it that they could send with their feet and even their behinds if they felt like playing the fool. By listening to incoming morse code they could even tell you who was sending the code to them. They identified the style of the operator sending the morse code. The old operators at Cape Town Radio would turn in their graves if they could see the station today. It has moved again and is now housed in a modern building and has all the mod cons of today's world. In the old days operators did the work manually, today they sit at computer terminals and can monitor all aspects of the operation at the same time. If there was to be another Suez crisis I wonder how they would hold up. With the reputation they have built up over nearly a 100 years I'm sure that they would come out tops. Here's to the operators and men who through their vigil on the radio waves of the world have most probably saved thousands of lives at sea without moving from their consoles.